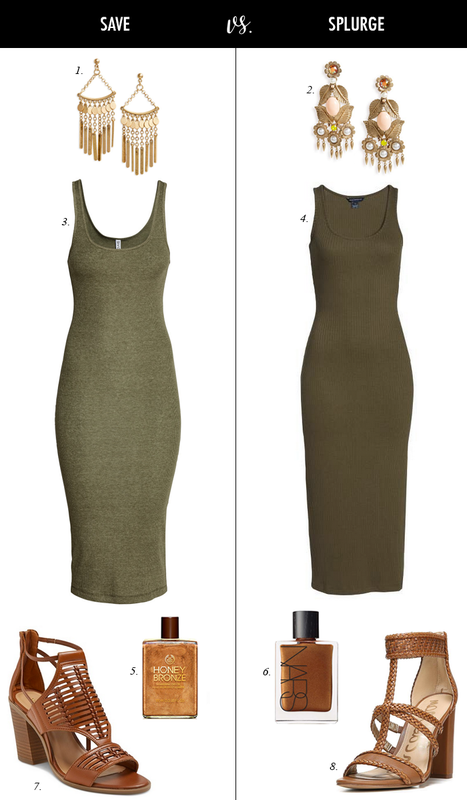 This ribbed tank dress for less would be a great summer staple piece for only $13. (And, could easily transition to fall by layering over a jacket or cardigan.) The entire budget-friendly outfit costs under $100 - with these chunky heel woven sandals that are only $25. The splurge outfit also has some great deals - like these woven sandals by one of my favorite brands that are marked down 40%. This budget summer outfit is something I would totally wear; however, I just need an event or place to wear it. I love getting dressed up – but the city I live in – just does not dress up like this – not even for a date night to a nicer restaurant. And, this look is not even that dressy - but I rarely see people dressed up in skirts or dresses for dinner, unless it is a special occassion. Do you ever feel like that wear you live? That if you were to dress-up for a date night – people might look at you strangely and wonder – why is she so dressed up? This ruffle top (that comes in both a polka dot print and black) is only $5. This is the cutest eyelet dress with ruffles and is only $10. This ruffle hem top is only $10. This blazer is only $15. This v-neck tee is only $4. This cardigan is on sale for $10. This quilted bag that reminds me of the Chanel bags is 40% off. This chambray shift dress is marked down for under $25. This sweater that I bought is under $10. I really love both looks! This is understated, yet so chic and I really love the splurge sandals! I love this olive tank dress and those woven sandals are amazing! I find people are pretty fashion forward here & some even go all out even for a trip to the mall! So that's one of the nice things about being in the city. Hope you are having a great week Lisa! Those chandelier earrings are so fabulous! What a chic summer look. These look so similar! I love the olive and rich brown. fun post! very cute summer chic look! I've always been curious about shimmer bronzers but have never actually tried one! I love the save shoes, so cute! Love that French Connection dress! I could never get away with a dress like that - but it would look great on you!